When Outlook Express is crashed, you would not be able to find the location of your DBX File, in that case OE DBX File Locator Software will find the location of your DBX file. The DBX Locator Tool detects all your files with attributes like File Name, Identity Name, Size, Creation & Last Accessed Date in a orderly manner. The pro version of DBX File Locator Tool gives the functionality to save all or selected emails on your local machine in the location you have specified. 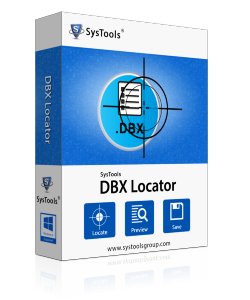 The DBX Locator software is Windows Universal in the sense that you will be able to install it on practically all Windows Operating System such as 10, 8, 7, etc. The User Interface of OE DBX File Locator utility is very simple and designed in such a way that users do not face any kind of inconvenience. The OE DBX Locator Software is capable of detecting multiple .dbx files at one go. The utility will detect all types of DBX files like; inbox.dbx, outbox.dbx, etc. ; from a configured Outlook Express profile. The DBX File Locator Tool is preconfigured with lots of features that will help you to find all your DBX files instantly. The DBX Locator software is easy to use and does not require any technical expertise. Shows all the .dbx files of configured Outlook Express instantly. Lists all the DBX files with all the associated attributes. Compatible with all the Outlook Express editions. Functionality to save all the located file at desired location. Supports Windows 10 / 8 / 7 / XP and all the other OS. Shows all DBX files like inbox.dbx, outbox.dbx, etc. Once the DBX Locator software locate the files you can either choose only the selected dbx files to be transferred or you can bulk transfer all your DBX file to a different location instantly. This way you will be able to save huge amount of time that otherwise would have been tiresome and time consuming. There are many other interesting features of the DBX File Locator software that will help you to speed up the whole process. Locate multiple DBX Files simultaneously that have been spread across various computer location. Get all in information with their associated attributes. Compatibility with all Outlook Express versions. All the files are scattered at different location? What to Do? If all the DBX files are randomly distributed across different location you can at the time of transfer make them converge at the same location where you want to save them. Is Outlook Express Email Client necessary for the whole process? Yes since the DBX Locator software will use some of the classes of the Outlook Express it is compulsory to have outlook express installed on your system. How many files will be listed? You don't have to worry about missing any DBX files as the DBX File Locator software is smart and will list all the available dbx files. What is the difference between Demo and Full version of DBX Locator tool? There is a slight difference between the tool. 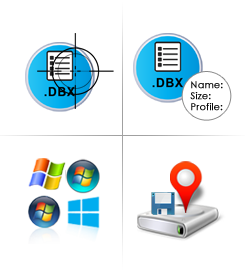 The Full version of DBX File Locator gives the functionality to save the .dbx files at specified location. I was not sure about the location of my Outlook Express emails. A friend suggested me the DBX File Locator Software who is using it in his organization. The DBX Locator tool is just awesome in every aspect and I have easily found my DBX files without any inconvenience. I want to migrate my Outlook Express emails to some other clients as the my OE is becoming old and outdated. The DBX File locator tool is very helpful and locates all my .dbx file instantly. I highly recommend .dbx locator software to everyone who is in search of their DBX files. Save all the located DBX files at the preferred location.